The Color Picker in Photoshop Elements 11 provides you with a color spectrum displaying all the colors available within a given color mode. If you’re in RGB mode, you can choose from a color panel of more than 16.7 million colors. (A) Color panel: The large color swatch displays colors according to the position of the color spectrum slider. (B) New Color Choice: Clicking the color swatch selects a new color for the foreground color. (C) Warning: Not Web Safe Color: Not all colors display equally on both the Mac and Windows operating systems in 8-bit mode when you’re viewing web pages. If a color is out of the Web Safe color palette, a cube icon appears. The Web Safe palette was introduced more than 15 years ago to create a color palette that used common colors between computer systems with 8-bit video cards. It’s almost nonessential today because nearly all computer systems use 24-bit color. You can safely ignore this warning. (D) Select Closest Web Safe Color: Click this icon to select the closest Web Safe color value relative to the new color. 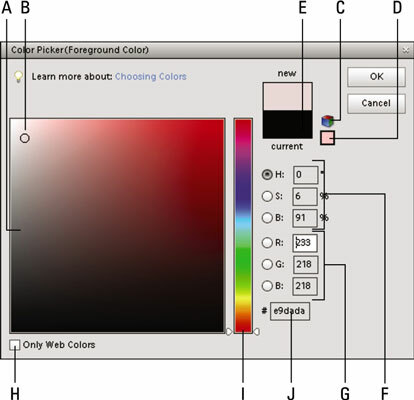 (E) Current Foreground Color: When you open the Color Picker, the color that appears in the Foreground Color Swatch in the Tools panel is displayed here. The Current Foreground Color Swatch and the New Color Choice Swatch show you a before/after difference between the previous color and the new color. (F) HSB values: This measure relates to Hue, Saturation, and Brightness. These values are the RGB equivalents for HSB. (G) RGB values: The numeric values for Red, Green, and Blue. As you choose other colors in the large color swatch or by sliding the color spectrum slider, these values and the HSB values change to reflect new color choices. (H) Only Web Colors: Select this check box if you want to view only Web Safe colors. (I) Color Spectrum slider: Move the slider up or down to change the hue and display a new hue range in the large color swatch. (J) Hexadecimal values: Colors are defined using specific hexadecimal values (or hex values for short). The hex value is displayed here for the current new color. You may find hexadecimal numbers valuable when integrating Elements photos and projects with programs such as Adobe Fireworks and Adobe Dreamweaver. These programs specify color in hex values. Click the Foreground Color Swatch in the Tools panel. Move the color spectrum slider to the hue range you want to use for the new color. For example, if you want to select a blue color, move the slider up to the range of blues. Click the cursor in the large Color Swatch to select a color. The new selected color appears as a rectangle in the New Color area above the current foreground color. The new foreground color selected in the Color Picker appears in the Foreground Color Swatch. If you want to change the background color, click the Background Color Swatch in the Tools panel, and the same Color Picker opens. Any changes you make in the Color Picker are applied to the background color.